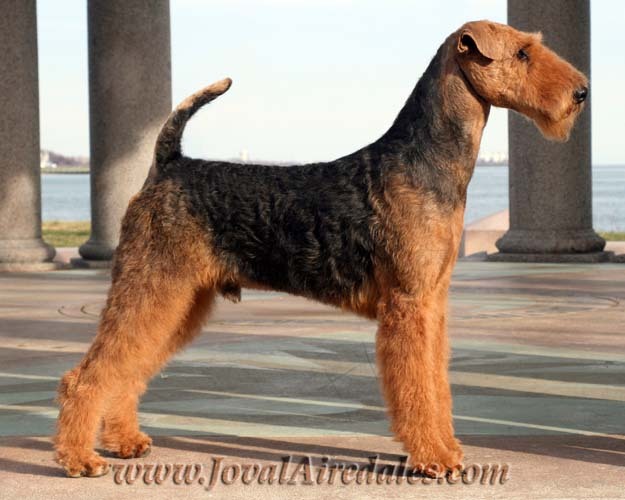 We at Joval are Extremely proud of our breeding program and the quality of dogs produced. along with hip scores and health clearances. 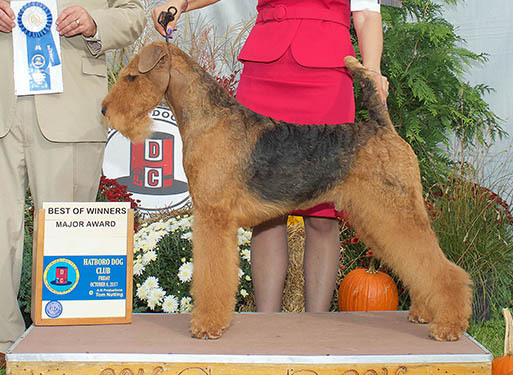 "Drew" is an outstanding dog with correct confirmation, powerful movement & temperament - all rolled into one package. 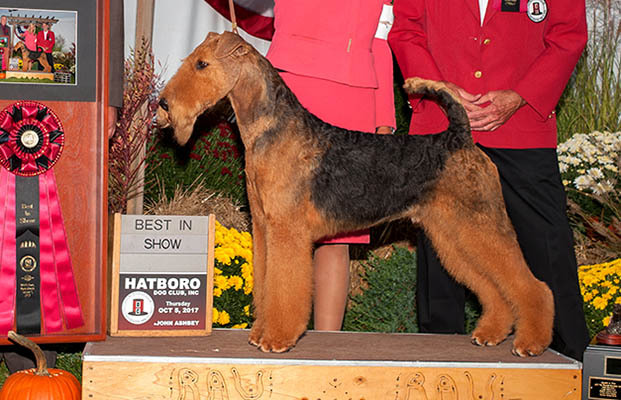 He was undefeated to his championship in 2 weekends with all majors, including a Best of Breed and Group 3 at Hatboro I and WD & BOW at Montgomery. Since becoming a Grand Champion, Drew has earned multiple Group Placements and continues to represent Joval well at selected shows and specialties. 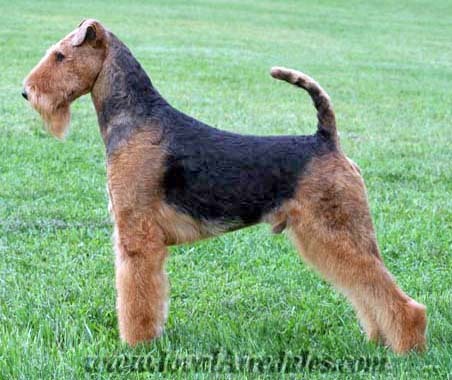 Drew has sired numerous litters in the US and abroad. Look for his progeny at upcoming sweepstakes. 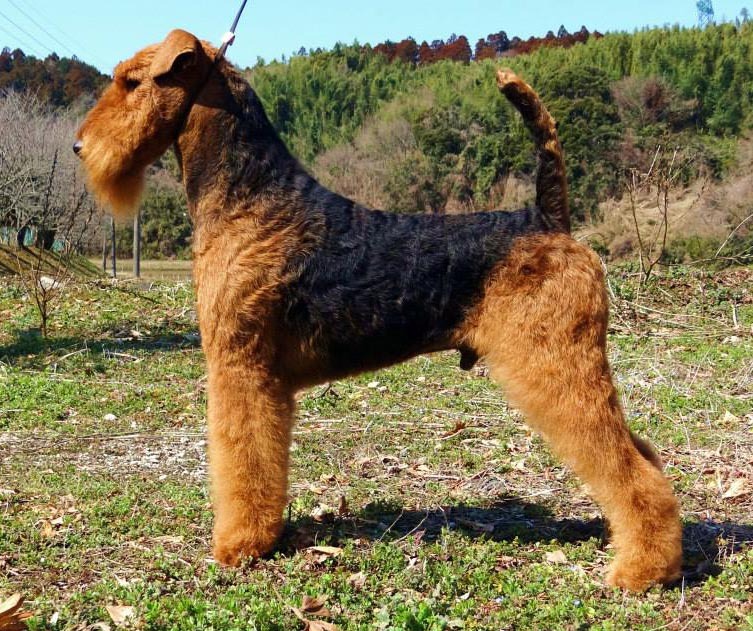 "Jake" is a stunning dog with excellent breed type, offering clean head, long neck, magnificent tail set and angulations, with lots of reach and drive. He earned his Championship in 3 Weekends and his Grand Championship in 3 more ... All this by the age of 18 Months. At the end of 2011 and after only 2 months of showing he was ranked as #5 Airedale with 2 Group Firsts and multiple other Group Placements. 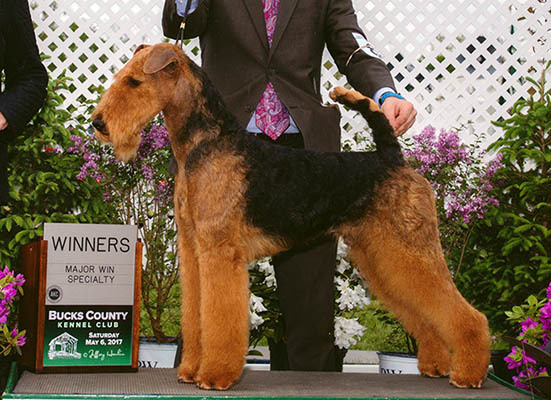 Jake also earned an Award of Merit at the 2011 Montgomery County National Specialty. 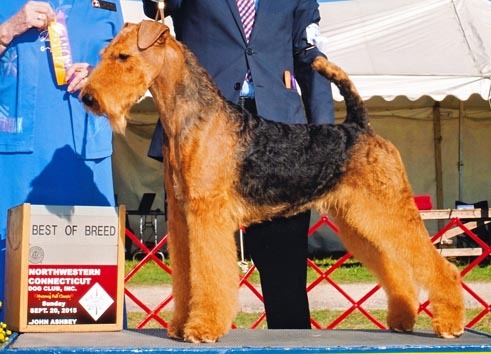 Jake is an excellent and proven sire who carries and passes along many of the desirable qualities of his mom and our Crufts & World Winner Joval Angel’s Kiss - ‘Krissi’. 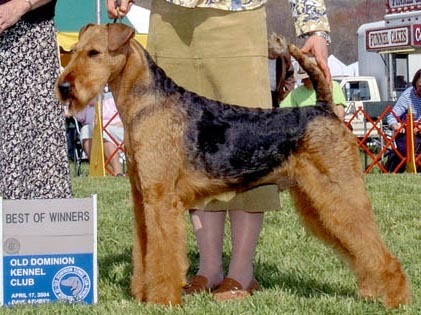 In fact, many of his offspring carry striking resemblances to Krissi as well as his litter sister Wispa - Am GCH Joval Angel's Whisper. "Eku" has been imported into the United States and has joined the JOVAL Kennel. Thank you Chisato for entrusting this wonderful boy with us. "Ozzy", is an impressive and well-balanced dog with an outgoing temperament, superb movement short back, beautiful angles, superior coat and lovely expression. He is a proven sire with many champions and promising youngsters to his credit. 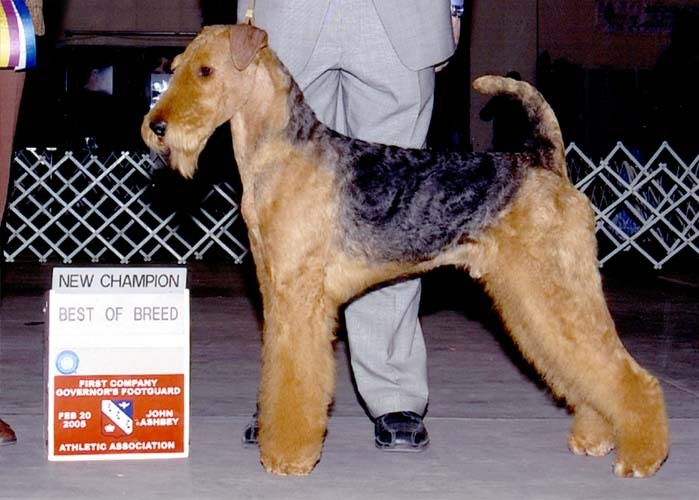 A Best in Specialty Show Winner with numerous Group Placements, he is a real showman who finished his championship with FOUR Majors over Two Weekends including going Best of Winners at Devon and Reserve Winners Dog at Montgomery in 2007. 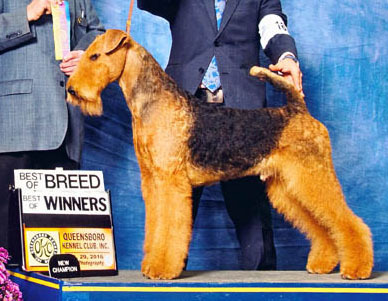 In 2008, Ozzy Won his Best In Show at the Terrier Breeder's Association Specialty in Canada, Won the Res. 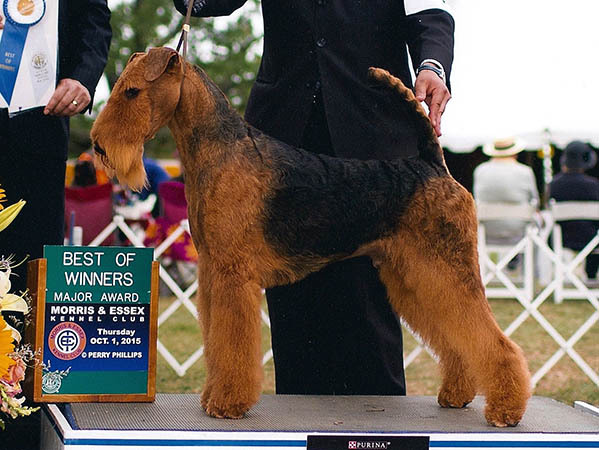 Certificate at the World Dog Show in Stockholm, and earned Awards of Merit at both the Hatboro and Montgomery Specialties. 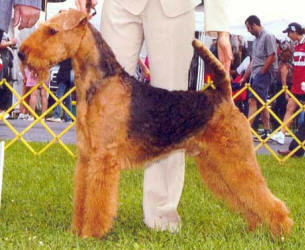 For 2008, Ozzy is #1 Airedale in Canada and #8 Airedale in the USA and named to the U.S. Eukanuba Top 25 dogs. 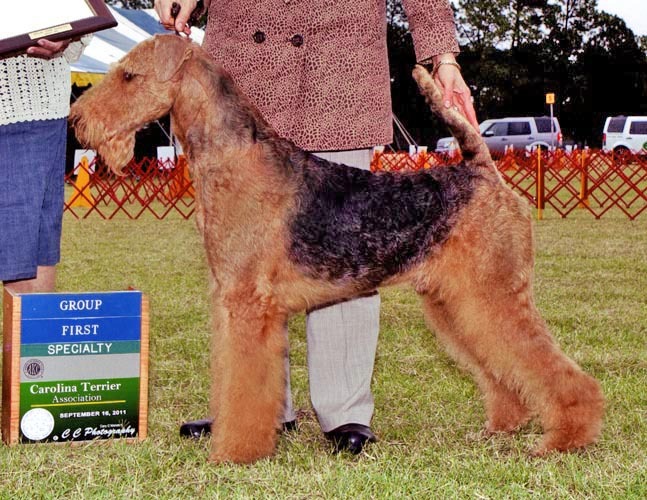 "Austin" is a multiple Best of Breed & Group Winner who finished his championship very quickly with 3 majors; the last one being Winners Dog at Devon 2008. 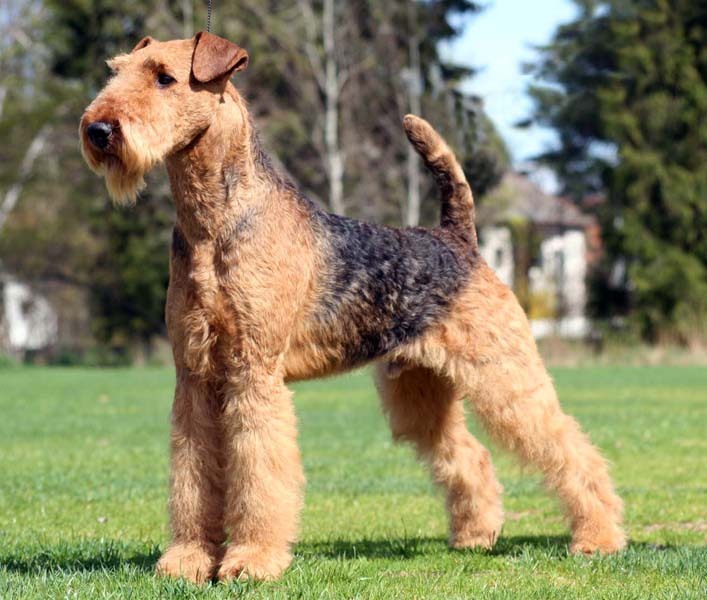 "Enzo" is a correct and moderately built dog who offers good head planes, nice shoulder layback, level top line, good tail set, great coat and well angulated behind with excellent movement. 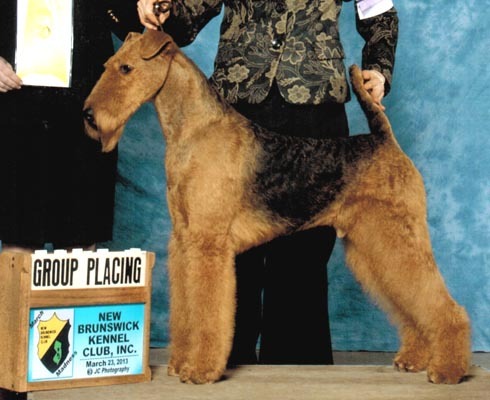 "Logan" is a Multiple Specialty & Sweepstakes Winner, earning numerous BOB's during his career. He easily finished his championship with 3 majors - going BOB over the specials. 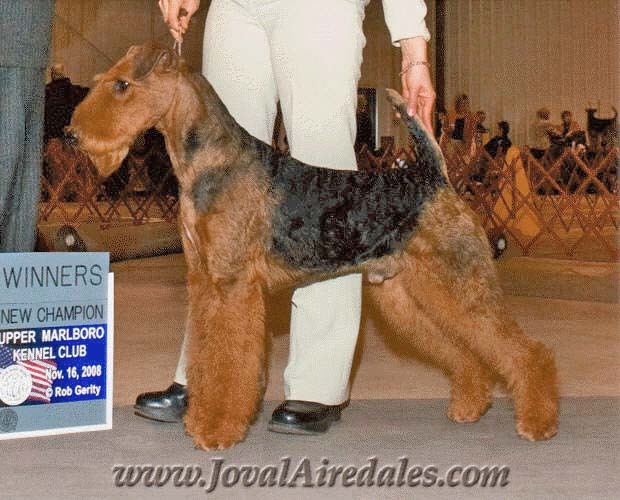 "Ollie" is litter brother to our Krissi, BIS, Int., Su, Ca, Am GCH Joval Angel's Kiss, who earned his championship easily, before turning eighteen months old, and has much to offer. He has a Stunning head and expression, short back, gorgeous coat, nice top line & tail set. He has good & correct movement with plenty of reach and drive. Ollie also has a wonderful temperament and is a pleasure to live with. "Evan" was imported into the United States from Russia as a puppy. He matured into a beautiful dog with lots of substance and bone. As can be seen in his pedigree, Evan carries a strong mix of Russian and English bloodlines from Stargus Kennels. His temperament and intelligence allow him to excel in obedience as well as conformation showing. 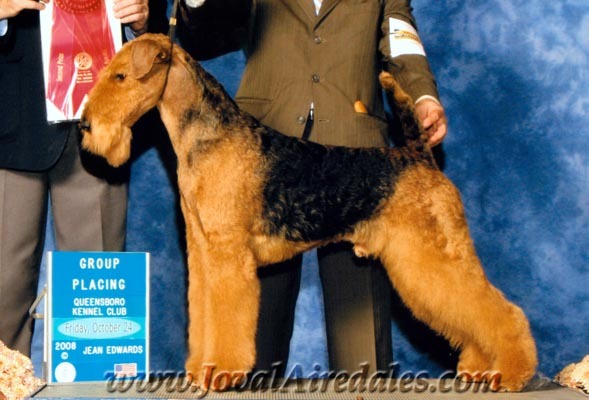 "Jack" is a Zeta (BIS Eng & Am CH Jokyl Flashback) son, carrying three-quarters English bloodlines in his pedigree. He finished his U.S. Championship easily by only 18 months old and then moved to England. 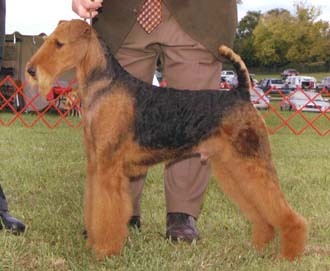 Jack was Top Airedale in England for both 2005 & 2007. He was also named Top Sire in the UK for 2007 & 2009. "Dillon" is Argentinean by birth, out of the Oak Grove Kennels. After arrival in the U.S., Dillon earned his U.S. Championship easily in three weekends by winning three majors. Dillon carries strong English lines through his world famous sire CH Jokyl Wizard and has sired several Champions in the U.S. and abroad. 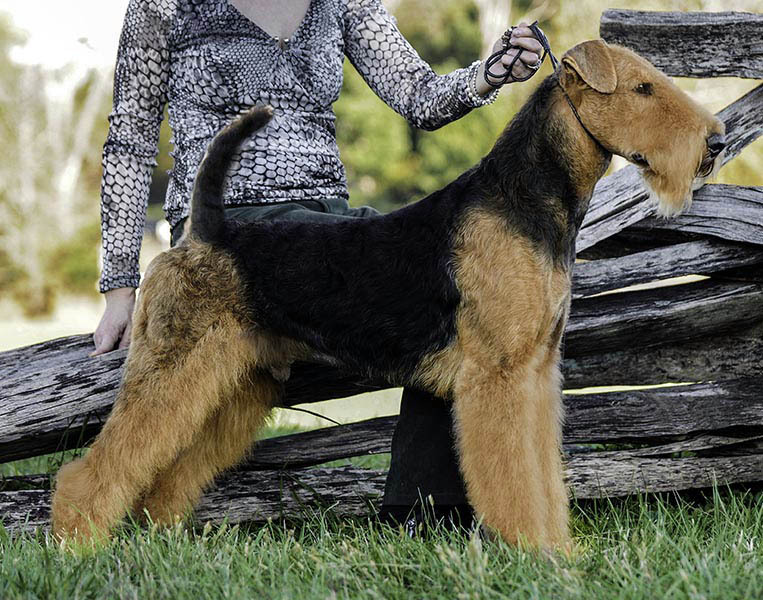 "Mason" went to Sweden when he was a youngster, but soon became well known in that country, being named Top Airedale in both 2008 & 2009. He is a proven sire with numerous offspring being shown in Europe towards their own championships.